It's A Family Adventure! 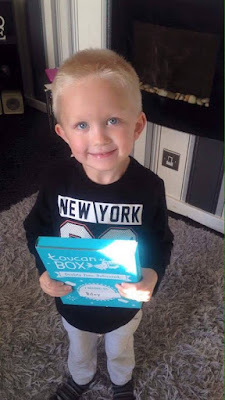 : Our Review of toucanBox! Whilst browsing my O2 priority rewards, I saw an offer on for a free Halloween toucanBox, and so because there was no obligation to continue the subscription after receiving the first box, and the fact that I was keen to find out more, I decided to take them up on their offer. Petite - £3.95 + 98p postage (fortnightly) - This includes materials for one activity. 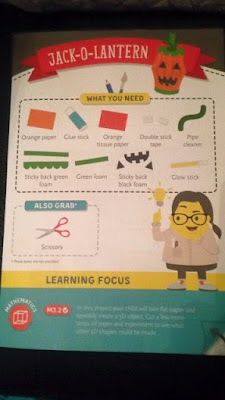 Grande - £9.95 + £2.95 postage - This includes 2 exciting activities, a book to share together & parent card which provides more ideas and information. 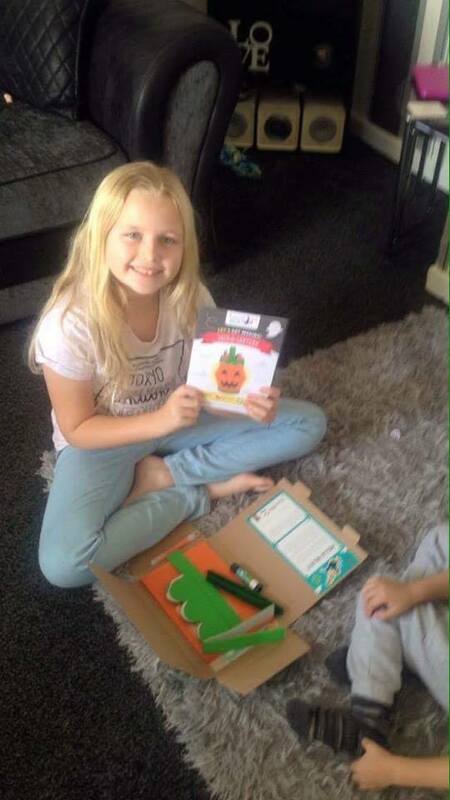 Super - £16.95 + £2,95 postage - This includes a book to share together and a parent card just like the Grande box, however this size box features 4 activities. That's certainly something to keep children busy. The boxes arrive addressed to your child, and my son was so happy to receive his own post! The boxes have your childs name printed on both the outside and inside of the box which helps to make it feel really personal. We cleared some space on the floor, and my daughter helped her brother to unpack the box and lay everything out. She told me that they needed scissors which was the only thing that you had to provide yourself, so I went and got these for them, whilst she began to read the instructions. It was really lovely watching the two of them work together. My daughter loves art and craft, and so it was the ideal activity for them to enjoy together and have some fun. The instruction manual also doubles up as an activity booklet with some fun puzzles to complete after you have built your craft item. The design of the booklet is very eye catching, with good graphics and easy to read text. There are also snippets of information for parents in the booklet which inform you what the activity is focusing on. For this activity the focus was maths, and helping your child to understand how you can take a flat piece of paper and create a 3D object. The front page gives you some basic but important information and tells you using a 5 point scale whether the activity requires grown up assistance, the level of messiness and whether there is any drying time required. The first inner page then provides you with a full list of everything you need. This is great as it allows you to make sure that you have everything in the box before you begin. My daughter laid out their materials in the same order they were displayed in the image, so that she could cross them off and make sure they had it all to hand. There is then the 'Also Grab' section which informs you of any additional items you may require that are not included, which on this occasion was scissors. The front page then opens out into a double page spread, and this particular activity featured six step by step instructions which were a combination of images and written information. It wasn't over complicated and I thought it was just the right amount of information for a young child to grasp and understand. I also felt that the images were a great help as it also gives children a visual idea of what their item should be looking like throughout the process. This helps to reassure them that they are doing it correctly. The activity took them both around 30 minutes which was the right amount of time to keep my sons attention, and the end result was fantastic. Together they had made a Jack-O-Lantern which looked fab. 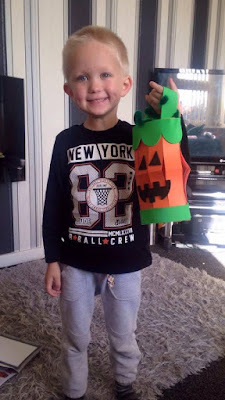 After they had finished the Jack-O-Lantern, they worked through the activity booklet together which featured lots of fun games and facts including creating a funky outfit for Frankenstein, drawing a funny face for a pumpkin and some spooky puzzles to name a few. Overall my children really enjoyed their first toucanBox, so much so that I will be upgrading our subscription to the monthly Grande box as I think that the book you receive with this option would also be great to have a nice little read after the craft. It would most certainly also help to pass the time if your activity requires any drying time, as you could have a nice read of the book together whilst you wait. I have deliberately waited a couple of weeks since receiving the item to post this review, so as not to spoil it for anyone who subscribes and hasn't opened it yet. *Disclaimer - The link to toucanBox is an affiliate link which means that I will earn a small commission for each referral that results in a purchase or the claim of a free box.